THE SCHOOL LIBRARY, NOW IN CLASSROOMS. Last academic year was all about bringing Lakshmi up to speed with complex words, encouraging Mounika to fuel her desire to write stories, teaching Swati how to join letters and form words and pushing Faizan to read whole paragraphs. How did we manage this? Well, by making them read more, and more of course. It goes without saying that books are an integral part of developing a child’s reading, writing and communication skills. But not many kids have regular access to books. Every school has a library. But how often can kids take books from there? Once, maybe twice a week? Is this enough for a child in rural India, who reading and writing skills are way below the required level? No. In fact, the 2014 Aser Report says that ‘of all children enrolled in Std V, about half cannot read at Std II level’. Which is why Akshara Foundation took the school library, and put it in every classroom – so that more kids have easy and unlimited access to books. While we did have a few ups, a lot of work still needs to be done. Let’s hope 2015 is a better year, words-wise. 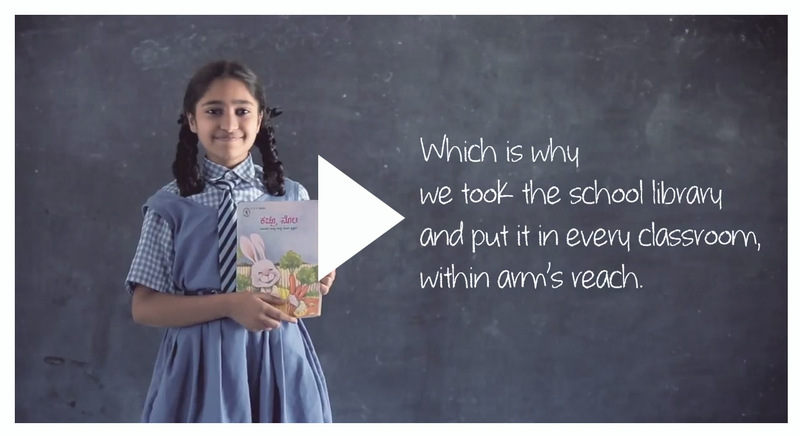 This video aims at spreading awareness of our Classroom Library, in the hope that the more people know about this initiative, the more children we can help. Inextricably linked to Akshara’s summer camp at the Government Higher Primary School (GHPS), Hasigalla, Hoskote Block, are the people who made it to the event, endorsed it with their presence and support and participated emphatically. We present a few snapshots. Fourteen members of the Aishwarya Lakshmi Stree Shakti Sangha, a women’s self-help group in Hasigalla, attended the summer camp. Their support makes a difference – women of the community taking a stand. As mothers, they are in many ways the backbone of education. The Sangha is a microcredit organisation, giving out loans at low interest rates to members in times of need – for a delivery, a child’s education, for agricultural work or to tide over financial hardship. The Sangha has built a corpus of Rs. 3 lakhs. “All collected by us,” says Sumitra, its President, with pride. The 20 members of the Sangha contribute Rs. 25 each every week. “This week’s collection is Rs. 2650,” says Sumitra, who used to be an anganwadi worker and is now a cook at a higher primary school nearby. They are women from modest backgrounds, Sangha members, well turned out, with a fine sense of proportion. A sense of things. Most of them have cleared class 7. “Some of us are not so educated,” they say. “So we don’t understand enough about education. But the school’s teachers keep instilling in us its importance. We are happy when our children do well and get prizes. We are happy that they are learning. We give prizes to the school’s children.” Six of the 14 members have children studying in the school. All of them expressed satisfaction with Akshara’s work and remark about the improvement it is bringing about. “When children spend time at the summer camp they will learn,” says Sumitra. “Children don’t show up even for the midday meals the school provides during the summer holidays. But for Akshara’s programmes everybody comes. We don’t have to push and coax them. They are women in a traditional set-up, most of them housewives, with an independent streak and access to moderate means, which keeps the domestic economy at home stable. Their spouses allow them the freedom to operate their microcredit schemes, or work if they wish to. “Our husbands don’t interfere,” they say. “Our policy is: ladies first, gents later,” laughs Vinoda, the Sangha’s smart, trendy Joint President. Subramaniam is the more prosperous of the two. Nagaraj looks careworn, with a creased face that talks of a hard struggle with life. He is a daily wage agricultural worker. His children, Shilpa and Sridhar, who were students of this school, are now studying for their MCom and BCom respectively. “I have come to support my school,” says Nagaraj with a head-held-high kind of humility. “My presence is my commitment to it. I would advise its teachers to improve children’s learning and ensure that every child coming here gets a good education. Subramaniam is also a proud tiller of the soil, a pride that his children do not share. He owns two acres of land where he grows ragi, a variety of millet. “When the rain comes. If…” he says, looking up with weary hope, a deflated hand raised skywards. Children are latecomers that first day of the Akshara summer camp. The Government Higher Primary School, Hasigalla, Hoskote Block, wears a wind-blown, deserted look – dry curls of leaves in the verandah, dust everywhere. Headmaster (HM) Hanumantarayappa is opening doors that have stayed stubbornly locked most of the summer. Akshara’s Cluster Facilitators are there. Srinivas, there are two Manjunaths, Lakshman and Krishnappa. A rock-solid contingent of courage, conviction and purpose. The Akshara banner announcing the summer camp as a part of its Namma Makkalu, Namma Abhimana (Our Children, Our Pride) initiative flutters against the outside grill, unmistakable and immediately noticeable. The Cluster Facilitators are arranging the classrooms, shifting the furniture and setting things up for the formal inauguration. The children troop in, faces radiant with expectation, the girls dressed iridescently in flowing, gold-laced skirts or in the latest trends in salwar kameezes, the boys in casual shirts and trousers or shorts. All bedecked for an occasion. Not one of them sartorially inelegant. They grab brooms made of coconut sticks, stiff from disuse, and buckets and cloths and become a whirlwind cleaning force, thorough and efficient. Triveni of class 6 dusts the furniture and sweeps in a rush, says a friendly, throwaway “Good morning” and continues the focus. Not satisfied, Jayakumari of class 6, repeats the exercise, her rust silk skirt trailing, holding her broom flat against the floor, sweeping every bit of dust out of the room. Jeju of class 5 diligently collects the trash in a bucket. It is difficult to believe, unless told, that he is mentally retarded and has speech impairment. Jeju is vigorous, salutes everyone, keen not to be left behind. Manoj, Pavan, Anusha, Bindu and Darshan gingerly raise their dangling legs for the broom to go under the bench they are sitting on. They are in classes 1 to 3, and exempted from this daily ritual in school. “Cleaning is a custom in school,” says the HM. Every day groups of children – boys and girls – take turns to sweep the school and the large compound. The principle of self-reliance is instilled early, and that no job is too low or menial to do. The children take pride in their work, they feel a sense of kinship with their school, and it drives them to do a good job. They are multi-dexterous. The next moment they are settling down on floor mats for other pursuits, other engagements. The Cluster Facilitators organised the room, the chairs are positioned, a small lamp was placed on the table with oil and wicks and a twist of orange flowers around the stem. Akshara designed the summer camp with two key objectives in mind, which Cluster Facilitator Srinivas enunciated at the inauguration. It was a three-day event for children, parents and people, with nearly 25 such camps taking place in May in Hoskote Block and Kushtagi and Mundargi Blocks in North Karnataka. At the GHPS, Hasigalla, the dates were the 24th, 25th and 26th of May. After a short introduction to Akshara Foundation and its work, Srinivas talked about Akshara’s aim to sustain children’s interest in learning and to preserve unbroken their link with education during the holiday season. It was the centrepiece of the summer camp. It would support, as evidenced at the Hasigalla School, a continuous flow of stimulus, sustenance and strengthening through group learning activities. The sports competitions punctuating each day were pure fun amidst the cerebral flexing. The second intention was community participation in education. The event was meant to precipitate awareness and a groundswell response to education, people coming forward and owning a village government school as their cause, their agenda, discussing problems and being part of the solution. Five volunteers who were local village youths from Hasigalla were intermediaries in the management of the summer camp. The idea was a far-reaching one – to involve local youth in education, get them invested, so that they felt it was their project and that they could be change-propellers. Somashekhara, the President of the School Development Monitoring Committee (SDMC), who is a staunch pillar of support for the school, said the summer camp will increase children’s knowledge. The HM called it “a special event, a special three days favourable to our children.” The school had progressed because of Akshara’s in-school programmes, he said, and prospered because of the SDMC that takes care of it like their own home. The lamp was lit, and Mounika, class 5, Bhavya, class 7, and Triveni recited a short morning prayer, the accents, the pronunciation and the emphasis impeccable. Sheets of paper went around the 45 children present who wrote down their names and grades. The Mathematics quiz was the first item to start off. The children formed four groups and sat in large circles. Quietude settled, but there was no fear or performance anxiety on any face. These children seemed capable Mathematics students, springing up to answer even before Cluster Facilitator Srinivas had completed his question. 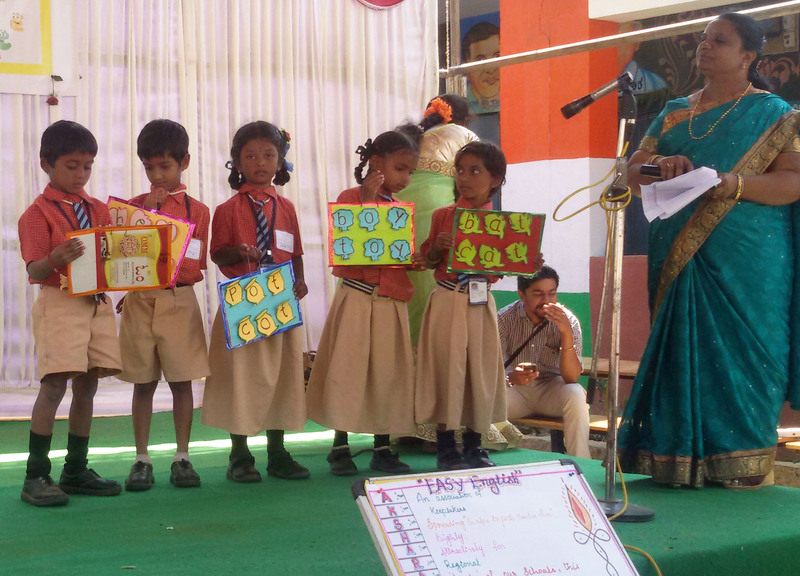 The quiz was developed by Akshara’s resource team and has more than 45 questions compatible with children’s competencies, not of the textbook variety, but questions of a general nature that applied across classes. For instance: What is the seventh month of the year? How many days are there in May? Name the shape that has three sides. How many minutes are there in an hour? What do you add to 999 to make 1000? Triveni, Manjunath, Soundarya, Ananth, Arun – all stood up with agile answers, with confidence. In the midst of all this certitude, little Sanjay of class 3 floundered on the question to his group. How many hours are there in a day? He pounced on it without consulting his team and said, “Twelve hours,” so sure of its accuracy. His group members fixed him a glaring, unforgiving look. He had spoiled their chances. Sanjay’s eyes welled up in humiliated defeat. As it happened, his group lost the first spot by a single point, further mollifying him. The whole incident was soon forgotten as chart paper, pencils and sketch pens are passed around for a drawing competition. Charan of class 7 had swiftly conjured a riotous scene of shrubs, trees and unusual green shoots. There was a house and a sun’s drawn face, like an old man’s, peering between hills, shining down fiercely, blighting all that foliage. It eventually won Charan a prize for its creative amassing. Madan of class 6 drew a cat. It was a neat delineation, quickly executed. Then, imagination ran out. After a spell of distraction, he added a tail and, in an attempt to thicken it to bushy proportions, he lost steam again. From a lot of other children, there were essays into the familiar – homesteads, animals, and flowing streams with embellished ducks. The children waited with bated breath for the English quiz to begin, wary yet expectant. It was every child’s dream – to become conversant in English. It was also a language that intimidated, as their grounding is weak. Some of the questions had to be interpreted in Kannada, but, overall, they acquitted themselves creditably. The questionnaire, created by the Akshara resource team, flung its net wide, with overarching questions that children ought to know. Which country do you live in? Which is your city? They were not daunting questions. Name the capital of India. Hands were not raised, no one jumped to attention. Manasa timidly got it right. A perturbed silence meets the question: Name the President of India. Pratibha Patil, someone suggested. Hamid Ansari, said someone else. The question was passed. Who is Karnataka’s current Chief Minister? The response was immediate. Who wrote the national anthem? Sagar had no doubts in his mind that it is Rabindranath Tagore. Who is your favourite actor? Jayakumari says bashfully, “Ravichandra.” Which planet do you live on? Manasa was sure of it. “Bhoomi,” she said, but couldn’t find its English equivalent. None of the children could, but the point was given. A session with LEGO, the learning-oriented play material from the world renowned Danish toy manufacturer, LEGO, was exhilarating for the children. It was their first encounter with the multitudes of multi-coloured pieces and bricks. And it was awe-inspiring, confusing and frustrating. Mounika pored over the LEGO leaflets with instructions in English, referred to the models pictured there and conferred with her team mates. It did not help, but Cluster Facilitator, Manjunath was with them and the bottlenecks were soon dismantled. Houses and towers and trees sprouted on a platform. Parents participated too, the mothers as collaborative partners, the fathers, reluctant spectators. A middle-aged father with a shock of grey hair pleaded that he was too old for a children’s game, watched noncommittally and retreated. Nagamma, a mother, teamed with students Ambika and Mala to fashion a watch tower with a man on top, possibly a guard. She laughed self-consciously every time she fixed a piece and surveyed the outcome. Jayakumari and Manasa had a big, impressive creation – a fort with towers and turrets, and bridges spanning roofs. The diffident charting of unknown territory was over, and in thirty minutes children assembled some inspired models, a small, exquisitely made field plough among them. Children revelled in the opportunities the summer camp provided for self-expression. Jayakumari was cheered on as she represented her group in a self-chosen creative act. Singing is her forte and her song is about coming to school every day and her experiences – the learning, the knowledge, the fun she has. She teamed with Bindushree for a prayer and a patriotic song. They sang at the top of their voices, their self-esteem soaring, and some of the front row children shut their ears and smiled conspiratorially just to taunt the singers. Manjunath presented a story laced with humour. Bhavya recited a rhyme and Madan would not budge even as a thunderous round of applause tried to get him to go up and say or do something. Extempore speech making on topics like Education, Health, Environment and School was an activity that provoked a gathering of thought and cogent presentations. Each group got five minutes to marshal their forces. The older children had an advantage. Anupa, a volunteer, coached her group fervently, asked for pen and paper and wrote down her points furiously on the environment, its beauty and how it is people’s duty to protect it and develop it responsibly. Poornima of class 6 found Anupa’s high-flown Kannada too challenging and handed over the short write-up to Jayakumari to read, who too dries up halfway through. The boys did a good job with Education and Health, prompted by Cluster Facilitator Lakshman, who handled the session. Monesha, a college student, began her talk about School with a short Sanskrit invocation and emphasised punctuality, discipline and respect to teachers and elders as its corner-stones. She summed up by saying that the onus is on children too to make school a conducive place. Cluster Facilitator Manjunath got the children to take an Akshara Foundation pledge that they will learn well and obey and respect their teachers; that they will study their subjects, take part in extracurricular activities and all school programmes and follow the rules of the institution. It was uttered with sanctity and vigour and evoked a solemn response from children as they repeated after Manjunath with a feeling of piety. The next item was the delineation of a Village Map, an activity that fostered awareness in children of their surroundings and got their bearings right. It helped them identify important locations, know what is available, where to access services. Children mapped their world with sure precision and knowledge – access roads leading off the highway and clusters of dwellings and trees drawn with remarkable agility. The village pond, the village square, the temple, the Hasigalla anganwadi, school and higher primary school, the ration shop and health centre were all featured. Prizes are adjudicated on the basis of the most comprehensive picture of their village the groups could come up with. The rough and tumble of play as the afternoon wore was an exciting time of day for the children. One sports event that went down particularly well with them was hitting the target, a game of misses, as it turned out. That did not dampen spirits. Group representatives were blindfolded and let loose with a long stick in hand with which to hit an improvised target of an inverted bucket. The children wandered here and there, lost, unable to find direction. Pavan was the only one amazingly on target, walking straight ahead towards his object as if with eyes wide open, causing scepticism in the Cluster Facilitators who suspected he could see through the lower slit of the cloth blindfold. Once his state of temporary sightlessness was tightly ensured, they left Pavan to find his way. He was accurate, did not waver and reached close, a foot or two away, his stick steadily poised for the strike. A crowd of children cheered him on uproariously. Victory was in sight. The boys urged Pavan, “Come on. Hit. Bring the stick down.” At the crucial moment Pavan flinched, shrunk backwards a little and the stick came down hesitatingly a couple of inches short of the mark. He sobbed in frustration, all the while watching Jashwant who came next, the last in the line-up. Jashwant went haywire, straying towards a tree and hitting its bark, and Pavan laughed with delight through his tears. He did not get a prize, but consolation was that no one got as close as he did either. Memories of the Summer Camp! Achievement was woven into the texture of the three days, without making it a paramount consideration. It was not about winning, but about accomplishment, about doing well, though children were spurred by the prospect of prizes and goals attained, the final triumph. The summer camp was about group learning and the freedom to be. Prize-giving became an egalitarian distribution, all four groups winning the first place in some category or other. Team members were each announced and awarded a prize. Everyone got a chance to be in the spotlight. Children queued up happily in front of their parents and the community for their prizes, more intent on being recognised than in any material reward. As the momentum abated and the children prepared to leave, this is what they had to say. The show in many ways belonged to Akshara’s Cluster Facilitators whose spirit remained undiminished till the end. They scripted its success. They orchestrated it. No detail was too small to be overlooked. They gave the summer camp in the Hasigalla School its structured rhythms, and yet made children feel the days were their own to savour. Learning was interspersed with fun, when the boisterous buoyancies of the children were allowed to flourish. In fact, there were times when it all seemed unmanageable, but order was always calmly restored, the HM and Aswathamma also contributing to the soothing process. The Cluster Facilitators kept children engaged and animated all through. Krishnappa took them through a resonant recital of rhymes. Srikant, Akshara’s District Facilitator, did a short, powerful cameo. Manjunath had an action song that children enjoyed. Their robust renderings and the children’s enthusiastic accompaniment rented the air. Seriousness was a mantle never far from reach either as they sat in a tribunal to select the winning teams. Or, as on the final day, Manjunath of the Hasigalla cluster and the other Cluster Facilitators organised a procession of children from the village to the school. The children held aloft the Akshara summer camp banner in an attempt to capture public imagination and draw attention to education. The major landmarks of the summer camp were plotted out by Akshara’s senior resource team. All the Cluster Facilitators, as implementers, were trained to conduct it. It was their commitment and dedication that saw the summer camp through, with an infallible sense of method and organising skill. For fifteen days prior to the camp, Manjunath of the Hasigalla cluster and Srinivas were in and out of Hasigalla, Vabasandra and Thimmasandra, spreading an awakening in villages somnolent in the sun, motivating children caught in the torpor of summer holidays, disseminating word about the summer camp, requesting everyone’s participation. The community could perhaps have done more, but the State Assembly elections were just over and it had left political rifts that had not healed. People owing allegiance to one political party declined to be a part of something the other party’s affiliates were going to be involved in. That the Stree Shakti Sangha came in full force and donated prizes; that parents attended the inauguration and the closing ceremony; that mothers made LEGO models with children; that the SDMC Presidents of both this school and the higher primary school came; and that everyone sank their differences to support the cause of educating their children is testimony to the work the Cluster Facilitators put in. Kanchan Bannerjee, Managing Trustee, Akshara Foundation, was invited to chair two sessions at a Workshop on Innovations in School Education organized jointly by Administrative Training Institute (ATI), Mysore, ANS State Institute of Rural Development (SIRD) and Azim Premji University, Bangalore, on the 28th of November, 2012. This is part of a series of workshops on innovations in governance the three institutions plan to conduct in collaboration, the objective being to examine selected cases of innovative practice that display a potential for enhancing the quality and effectiveness of public services. The one-day event focused on school education, an area of government involvement from the point of policy making and public service provisioning, an area that can be substantially improved. The workshop was a forum for the discussion of some noteworthy innovative initiatives in school education, bringing together government leaders and functionaries, educators, academics and education sector practitioners along with key professionals who have been associated with and/or have closely studied the innovation. Kanchan Bannerjee chaired two sessions on Innovations in Teaching-Learning Materials and Activity Based Learning. Three insights were presented in the sessions. the third on Teaching-Learning Materials – best when developed by teachers themselves, The Example of Teacher-Developed Films. The speakers, as workshop guidelines mandated, presented on: the nature of the innovation; its impact on education and whether that impact can be assessed; the challenges and the process of learning and adaptation as implementation progressed; the support or opposition it encountered from government, school managements, community; and whether the innovation can be more widely replicated.